One of the most important concepts in teaching my special education classroom is organization. Why is it important ?Organization leads to orderliness. Keeping a classroom in an orderly, organized manner is our job as teachers. It leads to smooth implementation of other classroom implementation components. It helps students focus.Yes, I know.....Blah, blah, blah, blah! We know all of these are true, but in my classroom of 12 children with a variety of disabilities, personalities and strengths, it was MANDATORY!Data is a large part of being a teacher these days. Keeping it organized during recording and storage is imperative.Today let's talk about 5 ways to take and/or organize data to make it easier to manage.Now I have been around for awhile so lets start with some simple ways to take the data. When I first started taking data, there were no apps, no iPhones and it was challenging to keep up with data on the fly. Let's face it, We take data in so many different situations and with so many different behaviors, we have to be prepared for just about use, do and experience anything and still keep recording data through it. Here are a few ideas to keep data organized and in one place during recording keeping. Masking Tape - a few strips of masking tape on my pant leg worked well. Each strip served very well for making tally marks for frequency behaviors. Usually I had a code on each piece of tape so I could keep each child's information private.Sticky Notes - Ohhhh do I LOVE sticky notes. I love them for a myriad of things but...we're talking about data here. When sticky notes came along, they were a godsend. They stuck to things as easily as tape, but provided more room for the prompting level or frequency tally. They are easy to stack at the end of a class or day and then unstick to transfer to a formal behavior sheet. Better yet, sticky notes fantastic because you can create a behavior sheet in which all you have to do is unstick the note from your pants or table and place it on the behavior sheet. Take things one step further with sticky notes and color categorize them according to student or behavior. This could make organizing them later much easier, if all the math data was on one color note or all of Sam's information was on green stickies. Easy to sort!Clipboards - I use many different sizes of clipboards as a way to keep data. Clipboards can be grouped according to class for which you are taking the data, by the student, or by the location in the classroom. I liked keeping clipboards in the math area for data keeping. This way all the adults needed to record data had access to them. Sometimes I decorated the clipboards with contact paper or put stickers on them to Notebooks - There are many different types of "notebooks" that you can use to gather and record data. You can use mini 3 ringer binders, notebooks of index cards or one notebook for a set of students. Data Forms Of course there are all sorts of forms out there for collecting and recording data. ABC check off forms, and tally frequency forms are some of my favorite. Data Recording Apps Once the App store became a reality, behavior and data apps have been growing by leaps and bounds. 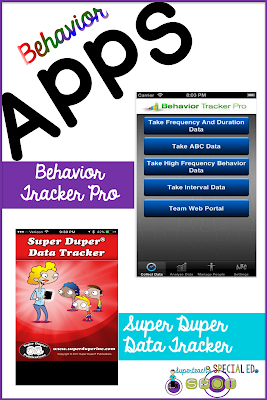 I have used Behavior Tracker Pro app through the App Store. It is a $29.99 paid app for the pro version, but it is worth it. You can use it with multiple students but you can also set it up for multiple observers, too. 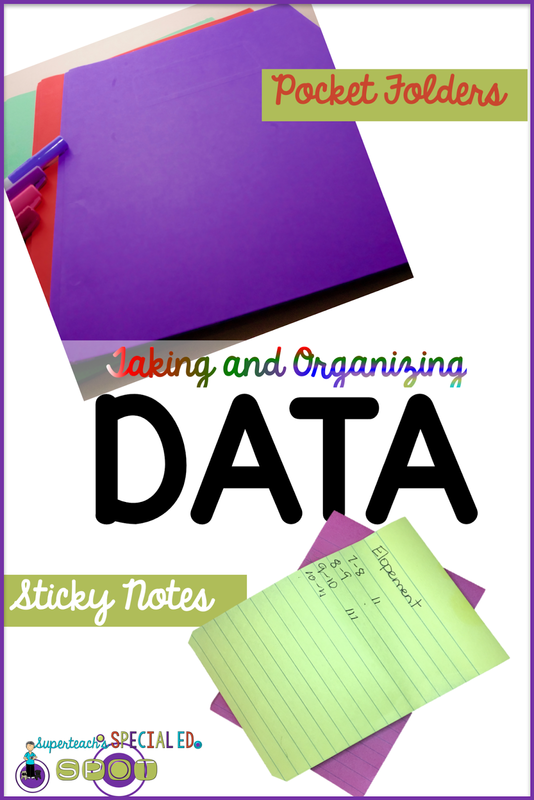 These are just a few ways to organize and keep data together. What are ways that you use?Have a great week! Hey Mary Ann! You nailed it! Data is so essential and yet finding easy ways to set up, access & organize our data can be much trickier. I LOVED your idea about using sticky notes to later attach onto a behavior data sheet, do you have any pics of or sample data sheets that you have set up this way? I would love to get a better idea of how you're doing this. Thanks so much!